Board President's four year term ends with board meeting, June 24th. "She is also an effective leader and wonderful storyteller..."
Nancy has volunteered her time at DOROT for more than 25 years and, throughout that time, participated with her family in Holiday Package Delivery programs. 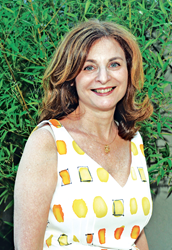 As DOROT President, she still helps with the Deliveries and can often be seen in deep conversation with other participants, sharing her enthusiasm and listening to volunteers’ stories about their visits with package recipients. Nancy also recognized the importance of having a vibrant board and together with the Nominating Committee successfully recruited six new board members during her tenure including President-elect Donna Jakubovitz. For more than three decades, DOROT has been an innovative leader in the fields of aging services and volunteerism. For further information about DOROT, please call 212-769-2850.